S/V NAVIGATOR, our Island Packet 40 foot ocean sailing vessel, departed Norfolk Virginia at 1018 on May 28, 2017 after two preparation days in port Norfolk with the entire crew participating. Crewmembers are: Captain Tom Tursi Skipper, Captain Jerry Nigro First Mate, and student crew members Jeffrey Crawford, Keith James, Manfred Tiedemann and Vincent Di Stefano. NAVIGATOR will make the passage to Bermuda via a non-stop ocean route. The cruise has an estimated distance of 670 nautical miles, and will take approximately 6 days to complete sailing both day and night. Bradley Mabe, a professional meteorologist and Maryland School graduate is providing weather guidance to the crew. Following is his first forecast. Sunday Morning - A low pressure area and associated stationary front will be moving E across Pennsylvania bringing a chance of light shower to the lower Chesapeake. The winds will generally be light and variable from 8 to 10 AM local time and should be mainly from the N to NW at 5 - 7 knots for your anticipated departure. Throughout the day winds continue to be variable, mainly from the Northern quadrant. Overnight, be mindful of possible wind shifts as winds begin to veer and become SW by Monday morning at 10 - 15 knots; continuing SSW to SW at 10 - 15 through the day on Monday. The western wall of the gulf stream from your anticipated position is at 36.2N 74W. No tropical cyclone activity expected. Hello all! Be sure to click on the spot link to follow the progress of NAVIGATOR and her crew. One note on our SPOT transmissions: The SPOT is far from infallible and a loss of signal is quite common. There have been times when we had no position updates for more than a day. Reasons can range from a weak satellite signal, a sail bag inadvertently shifted and blocking a clear "view" of the sky, or the SPOT batteries getting weak. The crew checks in with me electronically at intervals, and we will address such issues. Also, sailboat tracks are affected by wind direction, current, etc. and rarely result in a straight-line course. Surface Low moves NE of your anticipated position. Monday Morning (5/29) Winds WNW to W 10 to 15 knots. Widely scattered showers possible. During the day Winds continue WNW at 15 to 17 knots. Overnight, high pressure begins to build in W of your anticipated position. Winds continue WNW to W at 10 to 15 knots. Tuesday (5/30) Winds light and variable. South of a line between Norfolk and Bahama winds backing SSE at 5 to 10 knots. North of that line winds WNW at 10 to 12 knots. Wind direction will depend on your position. Afternoon and evening, winds S at 5 to 10 knots. All is well aboard NAVIGATOR. We've had a little rainfall and light winds from the south. We're heading directly into it. Everyone is doing fine! They are doing their tasks and we're functioning like a well working machine. As of noon today, Saturday May 28, the crew rotated down list one spot so that Fred is now Captain, Vince is Mate, Jeff is Navigator and Keith is Weather Communicator. Fred at the helm during a beautiful sailing day with 15 knot winds on the beam. Monday evening and overnight (5/29) winds mainly S close to the NC coast turning SW to W further East of your position. Tuesday Morning (5/30) winds light and variable mainly SE to SW at 5 to 10 knots north of Cape Lookout latitude. Winds W to SW at 10 to 15 knots south of Cape Lookout latitude. Winds becoming S 10 to 15 knots through Tuesday evening. Winds turning SW at 10 to 15 knots overnight. Wednesday (5/31) winds become SW to WSW at 10 to 12. Chance of showers and T-storms throughout the period. Tropical storm activity remains quiet. Tuesday 5/30 - Evening winds S 10 - 15 knots becoming SW overnight. Wednesday 5/31 Morning winds continue SW 10 - 15 strengthening a bit in the afternoon 15 - 20 and becoming WSW. Winds diminish in the evening & overnight and come back to SW at 10 - 15 knots. Thursday 6/1 - Weak high pressure to your South may causes some variability. Winds WSW to SW at 15 - 20 knots becoming 10 - 15 knots during the afternoon and evening. A chance of showers and T-storms through the period. Sea Surface Temperatures 72 - 74 degrees F. at your position. We left Sunday at about 1030 and got around Cape Henry by about 1400 in the afternoon. It was cloudy with no wind and we motored for about a day and a half. We had some drizzle at times but not much. We have had beautiful sailing for the last 24 hours. The winds filled in yesterday about this time and we had a terrific day of sailing today. We are making heading directly for Bermuda at this point. Right now the winds are light and blowing from the south. It's starting to get warm and muggy now, but prior to this it was a beautiful day. We had a very easy crossing of the Gulf Stream with nice flat water and a good wind direction and we made good time in the crossing. We are now about 300 miles out of Norfolk and we have about 420 to go to Bermuda. Right now we're sailing right on the track to Bermuda. By tomorrow morning we should be about half way. The crew is great and everyone is getting along fine. Tonight we had chicken stew. Last night we had franks and beans. The first night we had the famous Dinty Moore beef stew. We are washing dinner dishes in seawater to conserve our fresh water supply, since dishes take a lot of water. Fred and Jerry are honoring us by doing that chore. 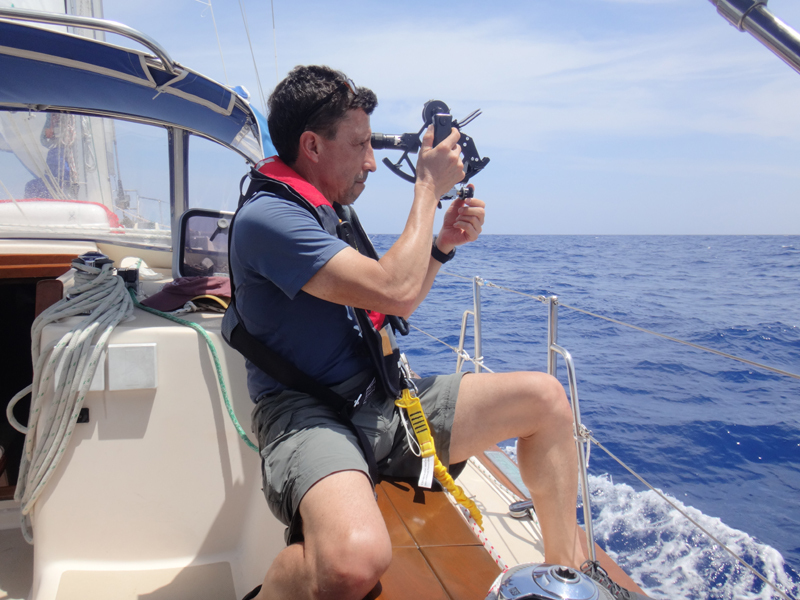 We did some celestial navigation work yesterday when we had the sun shining. That went well. We have been doing a lot of training with the onboard weather communications equipment. The crew is rotating assignments each day at noon. Everyone moves down the list that I gave you earlier, and that is working well. We are on 4-hour watches. 12:00 to 4:00 is Keith and Jeff (Midnight to 4:00 AM and Noon to 4:00 PM), 4:00 to 8:00 is Tom and Vince, and 8:00 to 12:00 is Jerry and Fred. That is working out fine and everyone is getting along very well and doing their watchkeeping assignments as necessary. NAVIGATOR is in good shape. No boat problems. We have been receiving Brad's e-mails regarding the weather every day and they are very helpful. This next rain storm that is coming your way we were concerned about this morning because we thought it was going to come out and greet us, but it apparently turned northeast, like they usually do, and we were far enough east of it that is didn't touch us. So while we had a beautiful clear sunny day, we could see on the Sirius weather chart that that storm was approaching and going up the East Coast. Wednesday evening - winds continue SW at 8 - 12 knots overnight and becoming WSW and strengthening to 10 - 15 knots before morning. Thursday (6/1) - winds backing to SW at 10 - 15 knots and diminishing in the afternoon. High pressure to you SE - showers and T-storms mainly NW of your position. Overnight, winds SW 12 - 18. A greater possibility of showers and T-storms. We had a bright sunny day today with beautiful sailing. We had 15 knot winds from the southwest and have been sailing along at 7 knots with smooth seas and we are making great progress toward our destination. We made 165 miles in the last 24 hours and have about 280 miles to go to Bermuda. We saw the storms coming up the east coast, as I mentioned yesterday, but came out of that very well; we were far enough east and we missed it all. Except for the first day out of Norfolk we haven't had a drop of rain on us yet. It's been perfect really. Plenty of sun. The other day we had some clouds come and go but it's been pretty docile the whole time. It sounds like tomorrow the wind might pick up but it will still be coming from the southwest putting us on a beam reach and making good progress. After doing the calculations on it, we saw that the Gulf Stream moved us about 75 miles to the north. That's quite a bit; more than I've seen previously. But, in advance, we had compensated for the movement, having gone way south before we made it to the Gulf Stream, so it wasn't a problem for us. We are keeping a good lookout for ships. We've seen some pretty big container ships out here. Now we are seeing cruise ships which are coming in and out of Bermuda. And, we've been doing some celestial work, which has been going well. Tonight we had pasta and meatballs for dinner. For breakfast we've been having eggs, either cheese omelets or those fancy egg things that Jerry makes with the hole cut in the middle on toast. For lunch it's usually sandwiches. NAVIGATOR is doing great. Everything is working like it should be working including the sails and engine. Everybody is sleeping well, and getting along well. No showers yet, so we're all very smelly. The crew loves it out here and they are all impressed with how nice the weather has been. Since we're not close hauled on the wind, it's been like a magic carpet ride. Thursday evening (6/1) - Winds SW 10 - 15. Overnight, winds strengthen a bit SSW 15 - 20. Saturday (6/3) - Winds SW 10 - 15 knots; showers and T-storms likely. Temperatures in the high 70s. What follows is a transcribed conversation via SAT Phone. Fred: Hi Rita, this is Fred. We're having a great time. I'm loving it! I love being at sea. I'm watching the sun go down right now and enjoying every minute of it. Vince: Hi Rita, this is Vince. We're having a great time. The weather has been absolutely perfect. We've had the wind on the beam almost the whole trip. We've been putting in a lot of miles every day. Everybody is having a lot of fun doing that. We're not getting rained on, and we're not getting knocked down. We're doing a lot of fun stuff. We're getting some celestial work in. So, it all going great! Jerry: Hi It's Jerry! The crew is fine, the weather is fine. Everything is fine! It's been a very docile trip. Jeff: Rita! We're having a wonderful lifetime opportunity! Thanks for doing all of the behind the scenes work! Tom: Keith is sleeping, so I don't want to disturb him. As you can see by our SPOT track we're pretty much sailing a straight line course toward Bermuda. Not like last year when we had wind on the nose for the entire trip! Our ETA in Bermuda is late Friday night or early Saturday morning. NAVIGATOR arrived in Bermuda at 1700 on Friday, June 2, and cleared Bermuda Customs and Immigration promptly. Fred and Vince departed that evening for accommodations ashore. 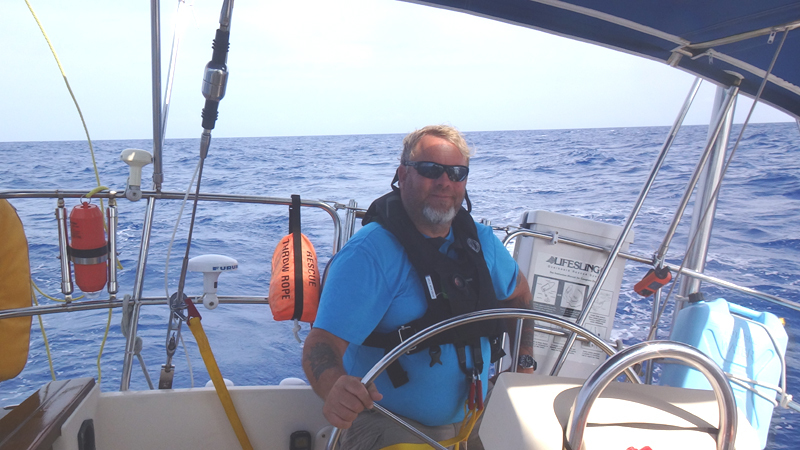 Keith and Jeff remained onboard overnight and departed ship the next day for ashore accommodations.